In case Coloradans were tempted to believe the ruse that embattled Democratic U.S. Senator Michael Bennet is a moderate or any kind of independent thinker, let us remove any pretense. In 2014, Bennet voted with 100% of the time with the President’s agenda. Is there anyone you agree with 100% of the time, PeakNation? We didn’t think so. 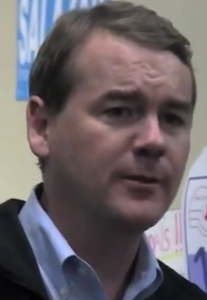 Michael Bennet is nothing but a rubber stamp for President Obama’s agenda. As a purple state, Colorado should have someone who thinks as independently as its citizens. In fact, this pattern shows a trend of being changed by Washington, instead of actually changing Washington as his percentage of voting with the president seems to increase over time. Of course, Bennet’s clear alignment with the president is probably not something that Coloradans will hear on the campaign trail. Afterall, the president’s poll numbers, according to Real Clear Politics are almost as bad as Bennet’s approval numbers. Last we checked, President Obama’s job disapproval numbers were around 56%. And, remember, in November, we reported that just 30% of voters think Bennet deserves to be re-elected. These are tough numbers for any candidate, but the Republican Party has fielded another year of great candidates. If Bennet looks worried in the picture above, he should.